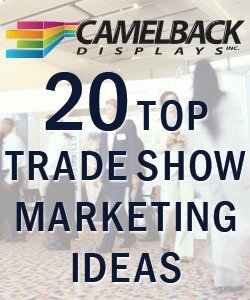 Unique trade show ideas and promotional concepts can help make your exhibit a sought-after destination for trade show visitors. Successful exhibitors are constantly on the look out for new, creative marketing concepts that differentiate their displays from the competition and attract crowds. To identify and evaluate new marketing ideas, attend events within and outside of your industry. Canvas the exhibition hall and see what others are doing with their trade show exhibits. When you notice booths that draw consistent crowds, talk with staff about their techniques to attract prospects. In addition, experienced companies that produce trade show booths can offer a bevy of creative ideas. Expert display firms stay on the cutting edge of design, exhibiting and promotional trends. The Center for Exhibition Industry Research (ceir.org) and trade show associations are also excellent sources for trade show ideas. To engage customers and prospects who are unable to attend the trade show, host a live webcast and stream video from your exhibit display. The webcast can take the form of a live "news program" featuring staff members who share the latest news about the industry and your products. Or, you can show product demonstrations and feature interviews with booth visitors. Director chairs for events come in handy for photographing, as well. Position two chairs in front of your oversized logo and snap pictures of prospects to take home with them. Since people often keep photos of themselves, this memento acts as a marketing tool long after the tradeshow is over. Be creative with how you use trade show flooring in your exhibit area by imprinting large, attractive promotional offers on your carpet or tiles that draw people into your booth. Have the type positioned to face the aisle so exhibition hall visitors will easily and quickly see your message as they walk down the aisle. Create traffic by renting trade show attractions for your booth, such as an entertaining robot, event photography machine, prize wheel, money blowing machine, or prize vault. While people are waiting their turn, your booth team can discuss needs, share your product information and collect prospect data. Attract booth visitors by providing software-driven handwriting analysis. Give visitors a sentence about your company to write on a piece of paper. Then, perform the handwriting analysis to reveal what their script says about their personality and work style. Not only will this create buzz on the trade show floor, once people write down your company message, they are likely to remember it. Use photography at your booth to take photographs of visitors and superimpose the images on unique, appropriate backgrounds such as a news magazine, Hollywood red carpet, surf board, etc. Leverage online marketing and social media opportunities before, during and after the show. Leverage content marketing opportunities, posts, video, and live streams. Take advantage of awareness initiatives on media that has the eye of your target audience, such as Facebook, Instagram, Twitter, LinkedIn, and/or YouTube. And, don't forget to market your show participation on your own website. Give attendees a virtual make-over, if appropriate to your product or trade show theme, through a computer program that imposes new hair styles, clothes and looks. Then print out a before and after photo (with your contact information) for the prospect to take home after the event. Offer aromatic food, candy or coffee in your display area, preferably available at the back of your booth so attendees will have to walk into your display area. This will give them an opportunity to meet booth staff and review your offerings. Some trade show event managers hire keynote speakers to drive traffic. These sought-after speakers present at scheduled times and give talks that attract crowds to the exhibition hall. Often there are opportunities to sponsor speakers. Sponsorship will heighten awareness of your company's presence at a show and drive traffic to your exhibit area. As a sponsor, your company will likely be promoted in tandem with speaker announcements, in show materials, and on venue signage. Construct a private, mini-conference area or room in the back of your booth area to talk one-on-one with highly interested prospects. Make sure the meeting area is well-lit and complete with sales materials, paper and writing instruments. Hire a professional service to shine shoes for prospects visiting your booth. This will allow staff to talk with prospects about your company and collect lead information while their shoes are being shined. Feature live product demonstrations that engage booth visitors and create awareness for your product and its distinctive advantages. Have a trade show magician or booth entertainer to attract exhibit traffic. Event performers meet with exhibitors before the show and incorporate the client's product information into their acts to help complement sales initiatives. Have booth staff wear the same company-branded clothing that includes the organization’s name, logo and website. This sends a message that your team is professional and cohesive. Have a drawing to give away the same or similar company shirt with your logo each hour or day-part. This is an excellent way to collect lead information from high-opportunity prospects. Have crowd pleasers such as cash money machines, prize wheels or promotional robots in your display area to draw people in so your team can engage them in discussion about your products and services. Use attractive rugs that have extra padding to enhance the allure of your booth space and provide comfort for those working for hours in the trade show booth. The right trade show giveaway can be instrumental in an exhibitor's efforts to draw traffic to his or her display area and mine for prospects. While promotional items are common trade show ideas to implement, the key is to make sure items have relevancy to your company and are useful to attendees. Effective trade show ideas and giveaways must also be unique from what other exhibitors typically use. Place promotional items out of the way rather than at a front table for any passerby to take. Give them out sparingly after booth staff have talked with attendees and determined they are potential prospects. Learn more about promotional giveaways >>. To help site visitors find high-impact trade show ideas for giveaways, Trade-Show-Advisor.com has arranged with nationally recognized BuyersZone.com to provide free price quotes from quality, independent suppliers of promotional products. Simply complete the form below detailing your needs. *Click on this link for free,no-obligation quotes on trade show displays >>.